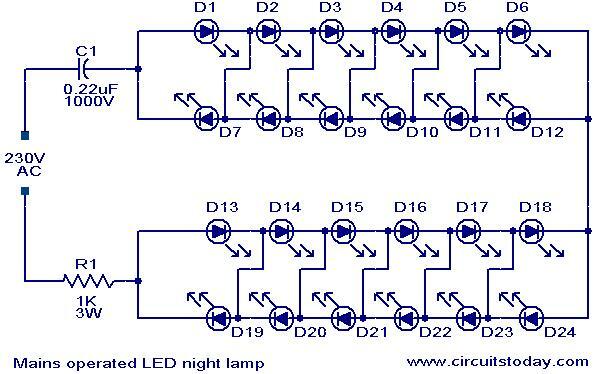 Here is a simple and powerful LED based night lamp circuit that can be operated directly from the 230V mains supply. The are total 24 white LEDs used and the lamp produces an output of around 15W.The resistance R1 and capacitor C1 provides necessary current limiting. The circuit is sufficiently immune against voltage spikes and surges. Circuit diagram withÂ Parts list. The capacitor C1 can be polyester type. White LEDs are preferred in this circuit. I want to do an experiment with more than 200 led’s how can i connect these led’s on 1 phase supply. Please give me an idea…..
Mr. Seetharaman. What is the value of C1 if I live in a country with 120VAC and 60Hz? hi, i want to make 33no of 5mm led 20ma output with 220v ac ps. so what are the components required? Hello Seetharaman, given the rating of the LED, for 6 pcs; 3 pairs back-to-back, what would be the value of the capacitor and the resistor? Hi Jay may be your capacitor is faulty. connect 0.25 in series with one pair of LED back to back and with 1k 1 watt also inseries and try for the glow. if nothing happens and if the LEDs glow OK. then the fault is that the LEDs are rated for 3.2volt 15mA. Hello Seetharaman, What could be the cause why all the LEDs got busted? It was working for some 15 seconds but it did not glow anymore after I have switched it off then on again. Hi Jeh one of yur LED might have blown. With a magnifying glass look into LED if any block spot is seen it is blown. you can check each LED’s glow by using a lithium 3 volt disc cell-faster method. Is your 0.35uF rated for 400 volt. Thank you Seetharaman for the support. More power to you and Congratulations again for a job-well-done. Dear Seetharman,I was the one who measured it actually and it is more than 5mm but less than 10mm. The store told me that it is 3volts. It has two leg terminals, cylindrical with almost flat top part. It looks the same as the 3mm size LED. Well, I just dont know if it falls to the 5mm size category. I can send you a photo to your email if you could send me yours. Hello Seetharaman,I am sorry I should have said 3volts 7.5mm diameter instead of 3mm LED. Will the values change? Hi Jeh 3 volt 3mm white LEDs will consume 20mA at 3.6 volts. 3Pairs back to back. Increase C1 to 0.33uF. no other modifications are required. The power consumption will be around 3/4 watts for the modified circuit. By reducing R1 to 220 ohms your consumption will be less than 0.4watts. Hello Seetharaman,using the same circuit but using only 6pcs 3volts 3mm diameter LEDs, can you help me if what values of capacitor and resistor should I use? I was able to complete the first project but the store run out of LED. Hi Jeh first LEDs anode to the second LEDs cathode and vice versa first LEDs cathode to second LEDs anode etc. as shown in the above circuit diagram. with 0.1uF you can connect 1 pair of LEDs back to back and use the illumination will be quite low as only 7mA wll be flowing through the LEDs. with .033uF a pasir of LEDs will get less than 2.5mA hence you will have only a faint glow. the charge available in the capacitor is getting completed through the leakage path in your holder circuit and you will have faint glow for a long time. then it will become dark. to avoid this problem add a 100K 1/4 resistance in parallel with C1 which will discharge the capacitor fast hence the glow LEDs will fade away fast. Thanks Seetharaman for the reply. Just a small clarification, when you say back to back you mean I will connect the two LEDs with one +leg of 1 LED to the -leg of the other LED and vice-versa? If I would like to use just one 0.1uf cap, how many LEDs and value of resistor should I use? likewise with 0.033uF capacitor? Hi Jeh for 50LEDs you can use 25nos back to back. You have to reduce R1 to 220 ohms 1 watt and increase the capacitor to 0.433 uF. That is 0.1 4nos in parallel with 1no 0.033uF. Hello Seetharaman, I have 0.1uf/630v and 0.033uf/630v capacitors available in the market. Can you help me if how many LEDs are required for each capacitors? I wanted to increase the nos of LEDs to 50.
can you provide me a detailed diagram for 50 leds/ 60 leds / 80 leds and 100 leds as well as C1 and R1 value in 230 volts/60Hz mains supply. your favorable and prompt reply will be highly appreciated. I wonder? it must use the capacitor to the circuit. This seems to be the simplest circuit I have seen so far as it does not use a rectifier. Hi Rohit use 0.47uF instead of 0.22uF, use 220 ohms 1/4 watt (will do) or 1/2 watt for 1k 3Watt. The power consumption will be around 2watts. I propose to use about 25 nos white LED in each group amounting to 50 nos. led (3.2v 25mA). I would be using 0.22mfd 400 volts and R1 as 100ohms 1 watt. The Power consumption would be approx. 3.5 watts. Kindly suggest if this is okay. I want to connect 7 leds 5mm(blue or white) what will be resistor and capacitor values. Thanks. what is the power consumption of this ckt? how watt? I assembled the above circuit bu using 1500 volt capacitor and it is working fine..
Hi Sison Connect 50LEDs back to back in series as above. Reduce R1 to 220 ohms 1 watt. change C1 to 0.47uF 400Volt. The only drawback is if you view the LEDs directly it will look like they are flashing. but illumination will be ok, you will not notice any flicker. Hi Ravinder I have assembled with 30 LEDs, it consumes less than 1.5watts, as a night light it is ok. by reducing the resistance to 220ohms 1/4 watt you can further reduce. it was giving low filickering illumination due to each LED operating for half the cycle, as there is no rectifier and filter circuit. Is the power consumption 15 W or is it the light output? If the circuit consumes around 2-3 watt, this would be excellent circuit for saving energy. Ravinder, Hyderabad, India. in series or in parallel, along with the LEDs. 5) why the glowing leds flicker even though it is not highly noticeable. Thanks in advnce. V.Gopalakrishna, Hyderabad, India. good circuit,but doesn’t reduces the led life drastically ?? What is the specification of the LED you have used in this circuit. If this information is given, it would be useful.